Time travel opens up all sorts of weird possibilities — especially when you visit your own past. There are paradoxes. There is endless weirdness. The past is a foreign country, so let's invade it and dump our toxic waste there. And so on. 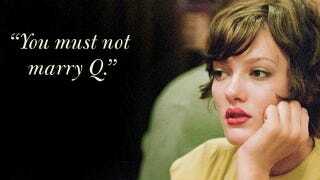 I've been meaning to read Q for ages, since it came out in August, and recently it got optioned as a movie. In the hands of a director like Spike Jonze or Michel Gondry, I could see this book turning into a beautiful, haunting film — there's definitely a tinge of Eternal Sunshine of the Spotless Mind about the whole thing. The misleading thing about Q, though, is that it's only partly about leaving behind the love of your life — there's a lot else going on, especially in the second half of the book. In Q, the main character is a history professor and struggling author, who's just fallen in love with a quirky free spirit named Quentina Elizabeth Deverill, aka Q, and his life is nearly perfect. Until the hero meets his own future self, aged 60, who warns him not to marry Q — because it will turn out badly, and his heart will be torn to shreds. Over time, the future version of the protagonist convinces him to leave Q before their wedding. Soon afterwards, other versions of the hero keep popping up from the future — each of them the result of the hero's latest set of choices — and warn him to do something completely different than he was planning to do. The endless supply of temporal Wite-Out becomes a flood. It's a nifty spin on time travel. And as a fan of the idea that traveling back in time always creates a new timeline, I appreciate the fact that the future protagonists are not the same future version again and again. Rather, each future version comes from a new timeline, in which the hero took his own future self's advice. And now, he's created a new future self who realizes that the previous future self was wrong about everything. The second half of the novel is increasingly frenetic with more and more future versions popping up to tell the hero to disregard everything the previous future self said. The more the main character — I don't know that he ever gets a name — keeps second-guessing himself and taking another do-over, the more he proves that people are pretty fungible, that you can become whoever you choose to become. You can be a historian, or an attorney, or a bookstore clerk, or a world traveler, or a Buddhist, or whatever. And yet, none of it really seems to stick, and over time the hero becomes more and more inauthentic. The idea of becoming your authentic self — and the notion that this requires less knowledge, not more, about your own future — is the most interesting part of Q. There are endless philosophical discussions about the nature of reality, and evolution, and whether society is improving, and so on — and yet, in the meantime, we see the main character quietly drifting away from the person he was probably meant to be. It's actually a bit of a shock, towards the end of the book, to realize that the "original" future self who visited the main character at the start of the book — even though he was unhappy — was much happier and more fulfilled than any of the later versions who took his advice. The front cover compares Q to authors like Kurt Vonnegut and John Barth, but it's actually a bit closer to some of the middle novels by Kingsley Amis, in which you see a hapless idiot stumbling through life, with endless self-justifying conversations, but it only really becomes clear towards the end why this character is such a fool. The main problem with Q — and something that might be less of an issue in the movie version — is that the main character is pretty unlikable, and his fussy narrative voice tends to grate after a couple hundred pages. This may be partly intentional — Mandery shows, pretty conclusively, that his hero is a mediocre author, who churns out a series of alternate history novels on semi-obscure topics — apparently, he didn't get the memo that alt-history is always about the Civil War or World War II. Later, Mandery's protagonist turns to humorous fiction, which falls flat, just as a lot of the narrator's own attempts at humor do. The book is at its best when its narrator is not really trying quite so hard to amuse us, but just telling his story, perhaps because Mandery does lack a certain Vonnegut touch. And I have a pet peeve against novels whose main character writes novels for a living. It just annoys me, probably more than it should. I also hate rock songs about how hard it is to be a rock singer on tour. And yet, having an author as Q's main character does allow Mandery to talk about the creative life, and the amount of pain and effort of will that goes into creating something that lasts and has meaning for other people. As he says at one point, "Writing is occasionally exciting; epiphanies sometimes occur. But for the most part, it is a monotonous, plodding endeavor." Creating a novel — or anything artistic, really — involves imposing our own vision on the future, in a way that goes beyond simply trying to build a life for yourself. Creating a work of fiction that you hope will outlive you is, in a way, a form of time travel. I won't give away the ending of Q, but it's a really nice end that actually makes the whole story more than worthwhile. You think you can see where it's going from a long way off, and then Mandery deftly pulls out a surprise ending, and everything that's gone before is refocused. The whole thing starts to seem like a love story after all, and all of the questions about trying to prevent this terrible future or that terrible future suddenly fall away. It's a beautiful ending, and it leaves you feeling as though this particular set of time loops have formed a graceful arc after all. So yeah, anybody interested in time travel — or a smart, engaging book about the perils of trying to rewrite your own past — should definitely check out Q.